If you are from Connecticut, this may not seem the least bit strange. But to many people, a steamed burger sounds just plain weird. In some parts of the country, anywhere with a “White Castle” restaurant, steaming is just another way to make a juicy hamburger or cheeseburger. 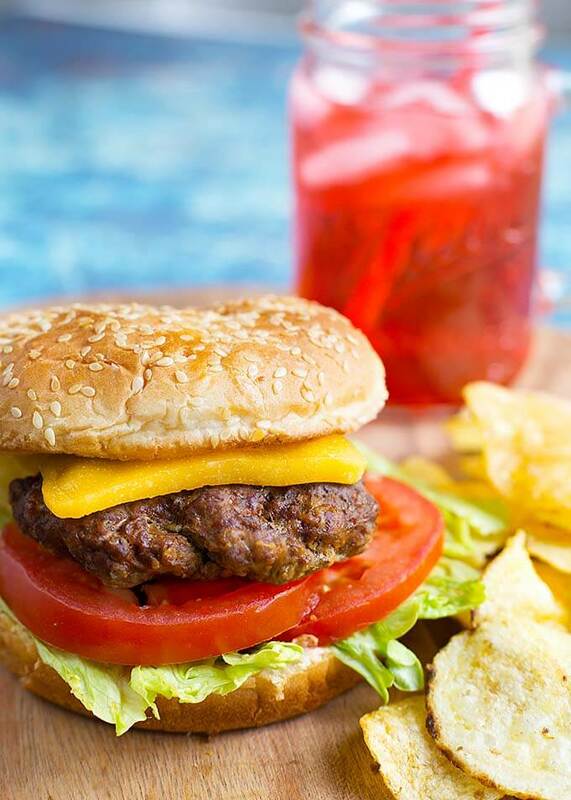 You can get juicy, tasty results with Instant Pot Hamburgers. Yes, a pressure cooker steamed burger! So, what in the world made me think to steam a hamburger in my Instant Pot? I was craving my husband’s famous potato packets (recipe coming soon), and I was sad because it’s still too cold to break out the grill. Then I thought hey, I can make those in my Instant Pot! We usually have them with burgers. Hmmm, I wonder what burgers made in packets like the potatoes would taste like? I could fry up a burger in my cast iron pan, and I do sometimes, but I needed to try this idea. I’m into trying new things. So, that’s what I did! It took a few tests as my first burgers were not as juicy as I wanted. You have to use a higher fat content to get that really juicy Instant Pot Hamburger (or any burger). Instant Pot Hamburgers are pretty simple to make. Once you make your meat mixture, make the patties, wrap them up, and steam them in the pressure cooker. When making Instant Pot Hamburgers, you can add any spices and flavorings you like, including onion, garlic, Worcestershire, etc. Just make them your own! 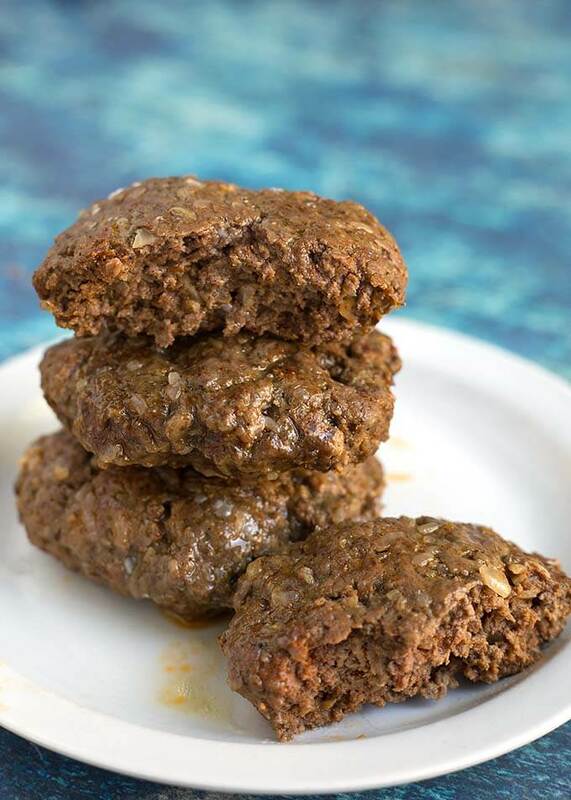 I like to make up a big batch of Instant Pot hamburger patties when the kids come to visit. I love how easy it is, and since the recipe can be doubled or tripled, I can feed the whole gang! Stay tuned for Paul’s famous potato packets, they are simple, and so tasty! 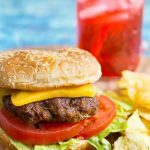 Instant Pot Hamburgers are so easy to make, and reminiscent of those famous burger chains that make steamed burger patties. These pressure cooker burger patties are simple and fast to make, and you can make a big batch at one time. Add 1 1/2 cups of water to the inner stainless liner of the 6 qt pressure cooker (Use 2 1/2 cups for the 8 qt). Place the trivet in the pot also. 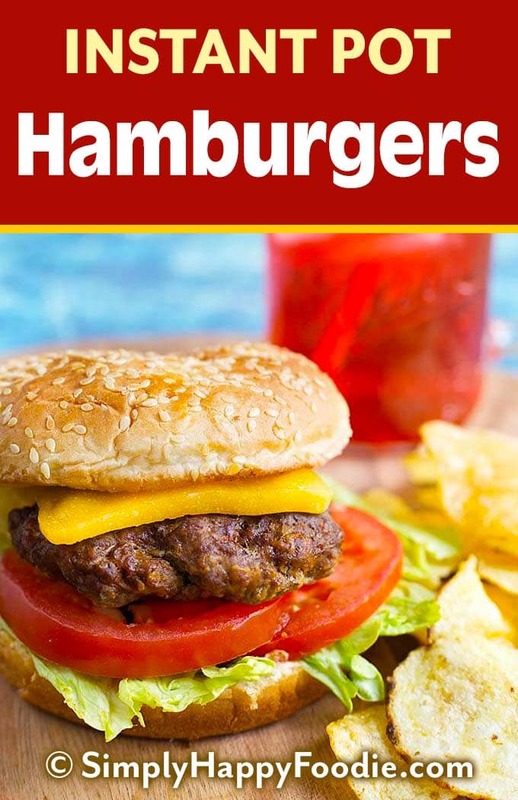 Mix all of the hamburger meat mixture ingredients together in a bowl with the meat. If making Version #2, mix the soup packet with the ground meat. Divide the meat mixture into 4 equal (4 oz) patties, 3 (5 oz) patties, or 2 (8 oz patties). press your thumb into the center of each patty to make an indentation. 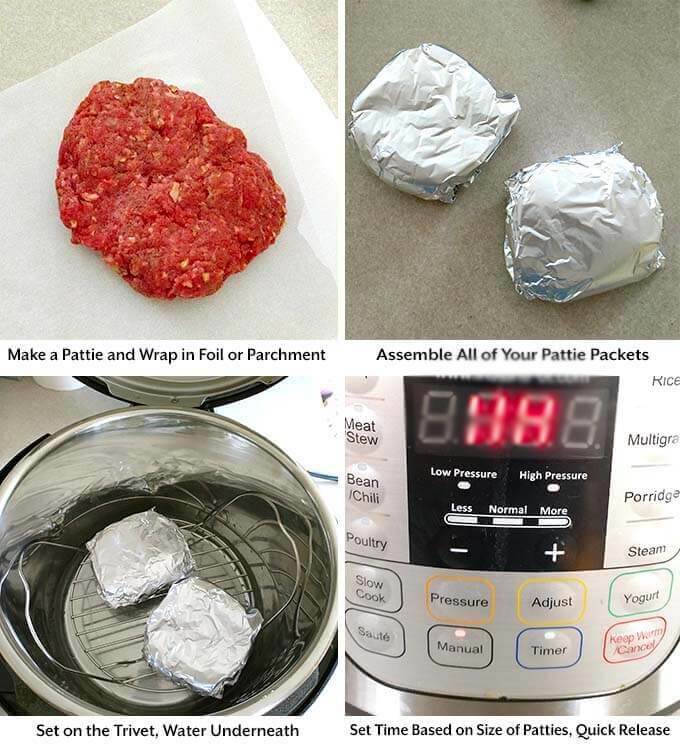 Wrap patties in foil (not heavy duty) or parchment. The wrapping and cooking under pressure is what steams them. Stack the wrapped patties on the trivet in a staggered pattern. Then place the lid on the pot and set the steam release knob to the Sealing position. When the cook cycle is finished, do a Quick Release of the pressure/steam (that means turn the steam release knob to the Venting position right after cooking is finished). Carefully remove the patties from the pot using tongs. Then let them rest for 5 minutes. Then unwrap them on a plate to catch the drippings, and make up your hamburger with all of your favorite fixin's! Such an amazing idea!! I’m thinking about getting an instant pot, looking at recipe ideas, so keep them coming. I will definitely try this! If I double the recipe, do I need to adjust the time? No, same time. Only adjust time if you make the patties larger or smaller. See cook times in the instructions. Do you think you could do this with frozen patties? Yes! Try the 15 minutes cook time, and add more time after that if you need to. Can you stack burgers on top of each other? Yes, you can make several at once. Hi, if you double or triple the recipe do you increase cooking time? No, only if you increase the size of the burger patties. I am going to try these this weekend. One more question, do you think can i do a few chicken burgers in there – same size for the same amount of time? Thanks in advance! Chicken burgers may not take as long as the beef. I have always heard to never use Quick Release when cooking meat because it will cause the meat to lose their natural juices. What would happen if you did try the natural release? Would it end up overl cooking the meat. Thanks so much for the recipe. I can’t wait to try this! Hi Marilee, you could do a NR if you want to. Since the burgers are wrapped in foil, the moisture won’t be sucked out of them. You will let them rest in the foil while you get the fixings ready, so that will be enough. You indicate to press the manual button which is high pressure and you also talk early on that you steam them. So I’m not sure if they are steamed using the steam function or cooked at high pressure using the manual button. Thanks. Hi Karen. Yes, the Pressure Cook/Manual button cooks the under pressure, and since they are wrapped, they steam under pressure. Either way, in that environment they would be steamed. I hope that makes sense. When I steam using the actual Steam function, I will be very clear as to the method/setting so you will not have to guess! Thank you for your question. Are the hamburgers fully cooked? Hi Joan, yes they are. If you like a pink in the middle burger, you will ned to adjust the time. With all of the e-coli scares and such, I opted to make the recipe be for a fully cooked burger. Thanks for your question! Do you put the cheese on these before or after cooking? You can, and it gets very melted. If you do, then maybe slice the cheese thicker. Try putting the cheese in a ramekin at the same time you steam the burgers. I saw a burger place that did steamed burgers in little trays and they also did the cheese in a separate tray. I did mine stuffed, so the cheese inside the burger, jucy lucy style. Turned out great! hello, love this idea. If you want cheese on them must you add it after cooking? Thank you. I think after cooking is better. If you want to add it before cooking, slice it thick. I made these and they were awesome! I did meat mixture #1 but reduced the salt a little. Really good! Thanks for the recipe, Sandy! Nice! Thank you for your review! Idea on the time adjustment for frozen turkey patties? I would try one at 10 minutes as a test and adjust from there. My pressure cooker is an Elite brand, it doesn’t have a stainless steel trivet, only a very sm stainless steel rack, that wouldn’t hold much, I’m not sure what it’s even for. Any ideas on how I could do the burgers then? Just stack the burger packets on the rack you have. You just want to keep them above the water. I have made these twice now. Love them! This time I made the packets the day ahead so there is less fuss when company is over. Potato salad made (check), hamburgers made (check),! All I have to do on Canada Day is put together a green salad and fixings and cook the burgers in the fabulous Instant Pot!! Easy, peasy! Top it off with Strawberry shortcake and we have a meal to be grateful for. Thanks for your recipe! Wow Heather! You will really be able to enjoy the day since you are so organized! I hope you all have a wonderful Canada Day! Thank you for your review! Dee the cook times are from 10 minutes to about 14 minutes, depending on the size of the patty. I don’t know where you saw an hour. I’m sorry if I somehow gave confusing instructions, but I don’t know where the hour is. It takes a few minutes for the pot to come to pressure, but you do a quick release, so that’s pretty fast. I used turkey patties, they were delicious, very moist, even the leftover one was still moist the next day. Hi Judy, I’m glad you liked this recipe/method of cooking burgers! Turkey burgers are a favorite of mine. Thank you for your review! Did you adjust the time for turkey burgers? How long would you cook 4 patties? Are these actually browned on the outside? No, they are a steamed burger. Can you grill these over a super hot flame to get a nice sear on the outside while retaining the moisture on the inside? HI Justin, I’ve never tried that. I either grill or steam. Let me know if you try it! Hi Sandy! How many have you been able to fit in a 6QT pot, assuming 4-5 ounce burgers? I can’t remember. Maybe 8? It’s been a while since I had to cook for so many! That’s great! Thank you for the review! I have been wanting to try making a burger in the Instant pot especially since our BBQ is broken. Tried a different recipe last night that called for cooking the Frozen patty for 30 minutes. It came out like a Hockey Puck. Decided to find another recipe and found yours. Thank you so much for having the cooking times for the different size patties. Hubby took a bite of the Burger (and he was not thrilled iwth the idea of it being cooked in the Insant Pot) and I got a big THUMBS UP and happy food eating sounds. I wanted to leave a 5 star rating but it wont let me click on the stars. I came across your recipe yesterday and made these last night. Used recipe number 1 and made 8 ounce patties since ground chuck tends to shrink. I have to say, this is one of the best burgers I’ve ever eaten. My husband got home and I asked if he wanted a burger. “You cooked burgers?” he asked then replied, “I don’t smell burgers.” I h ad kept them in the Instant Pot to keep them nice and warm for him. After he had supper, I was told this is the way we need to cook our burgers from now on. They were the juiciest burgers we’ve ever had. Thanks for sharing! I tried these burgers tonight. I had 16 oz of beef, that were separated into three patties. One might assume that each patty was 5.3 oz. I cooked them for 12 min, did QR, and let them rest for 5 min. They were raw, raw, raw on the inside! It sounds like I need to scale up my time. Do you think jumping up to 15 min is best (we only have three meat eaters in our family, so this will be a common scenario for us) or is there something else that could have gone wrong? Hi Ella, yes, I would try 15 minutes. Make a thumb indentation in the center of each patty. Be sure to use regular weight foil (not heavy duty, or add time), if using. Also 1 1/2 cup of water in the 6 qt pot, 2 1/2 in the 8 qt, and use high pressure. Please let me know if this works for you. Maany others have had success, so I want to help you have a great outcome as well! I would like to try these but I only have heavy Dudy aluminum foil. Do you know what will happen if I use this? Hi Ryan, I would go ahead and try it by adding 2 minutes to the cook time. Allow yourself time in case you need to put them back in for more time. How much water do I need for the 3 quart mini? 3/4 cup to 1 cup is what I use. I have preformed patties, would the cook time be the same for 4? I think it will be close. I would test 2 and see if they are to your liking at the time in the recipe. Made these burgers tonight with heavy duty foil; added 3 minutes to the 15 minute cooking time, and they were perfect!!! Added kraft singles to the patties after cooking, and had a pot of chili ready…best chili cheese burgers ever!! Awesome recipe!! Thank you! That sounds great, Lauren! Thank you! When wrapping the burgers in foil is it loose wrapping or a little tight wrapping? Not necessarily tight, but sealed as well as you can. Did 5 hamburgers at the same time, I thought they were 4oz eac. but went done, they were like 8oz. They came out very good and fully cooked. My family enjoy them. Will do again. Pass my test. Thank you,that’s one more receipt for my IP. What an excellent way to cook burgers! There are only 2 of us, so can I cook 2 in our Mini? The Mini has lower wattage than the 6 qt, so I would imagine I would have to increase the time. Thank you so much for this recipe! Do these shrink a lot like when you grill or cook them on the stove? I’m just wondering if I should make them bigger than the bun like I normally have to. Thanks! If you do the step of making a dent in the center, they will shrink less. As someone born and raised in Connecticut, steamed hams (ok that was a Simpson’s reference) are an acquired taste…mostly because the truly steamed burgers have a grayish look to them which is a bit offputting. The burgers will just be a little less juicy. HI Sandy, I was just wondering today if hamburgers are possible in the IP! Timely. Is it possible to cook one burger? What would you suggest for the cooking time? I’m an IP Newbie! Thank you! I think you could, though I haven’t tried just one. I would follow the recipe for the size patty you are making and see how it comes out. I am SO excited to try this recipe tonight! I am making a recipe for stuffed chicken burgers with cream cheese, bacon and green onions. Do you think the filling will spill out or no? I seal them really well but don’t want them to leak out. A little might leak out, just try not to overstuff them. BTW, YUM! I made these on Monday night using ground turkey (my own burger recipe). They are FANTASTIC! Moist and still moist 3 days later. I’m making burgers and meatloaf in the instant Pot from now on. Thanks for the great idea! Quick, easy and delicious! All I added was a little A-1 to the top of the burger before wrapping in foil. Since I’m doing Keto right now I ate it with shredded sharp cheddar, shredded mozzarella and pico de gallo on top. Thanks for the recipe! My wife was working late and I needed to cook up something for the kids. I had some ground turkey and a ranch seasoning packet so I gave it a go. They turned out great and the kids loved them(although they had some reservations at first because they weren’t grilled). Just out of curiosity , if NO foil is used (burgers directly on rack) should you then do a COMPLETE NR till the pin drops?! David, I believe the burgers would cook faster, so probably only a 10 minute NR. As a matter of curiosity, what us the purpose of making an indentation with thumb in center of burgers? The indent helps keep the burgers from shrinking. If I have 4 patties, arrange them so they over lap each other? Just like with bricks. Offset them a little, if you can. It’s not critical. Yes, you can use parchment. Just fold a piece over the pattie and roll the edges together towards the center. I will need to do about 12 burgers for company. By overlapping/staggering the stacking process, would the cook time remain the same as for 4 burgers? They should. I would leave yourself a few extra minutes. If the burgers aren’t quite done, close the lid and let them rest longer, or turn on the sauté setting to get the water hot again and close the lid. Then turn off the sauté setting and let them rest a few more minutes. I love this idea and can’t wait to try….. have you listed the potato packets yet? I’d love to do them! You dump it out. They didn’t seem greasy to me, just juicy. Maybe do a test of a couple and see if you like them. Someone asked if the burgers turn out brown, and your response was no, because they are steamed. Then someone posted that they do turn out brown, and the photo shows a browned burger. So, I’m confused! What I thought they meant was do they get browned. They do darken because the meat cooks. The color will also depend on what you have added to the meat to flavor it. Things like soy sauce, Worcestershire, beef bouillon, etc, will darken the meat. The cooking process will darken the meat also, but the burgers won’t have a browned crust. How would you go about storing extras after cooking? Leave them wrapped and into the fridge or unwrap and let out juices, then re-wrap and store? I would rewrap them in plastic wrap and put them in the fridge. Made this using your recipe guidelines but after burgers were done I put them in some brown gravy for a hamburger steaks. It turned out great and I am a Insta newbie. BTW I used 90/10 hamburger meat….still very juicy. Thank you so much!! !